Sorry I didn't get round to reporting on any more companies on Friday, I was too tired. Have decided it's time to focus on health, so spent the weekend charging around on my new bike. It seems to have blown away a few cobwebs! A lot of regulars read this column, so David Stredder has asked me to mention that there is NO meeting tonight. It has been pushed on to next Monday, 26 Sept. I like webinars, as they save me a trip into London, which isn't really worth it usually just to see one company. Fairpoint management are doing a webinar for investors today at 1:30pm. I've got the date right this time! Here is the registration link. Correction to H1 2016 results - well this is embarrassing for the company. It looks as if they did their sums wrong in the most recent results, with the EPS figures being incorrect. Today's correction only seems to refer to EPS figures, so that suggests someone used the wrong denominator when calculating EPS, but that the numerator was correct. Sloppy. Mind you, this company has a long history of putting out nonsense figures, so I suppose it's par for the course. Response to announcement by Slater & Gordon Ltd - of more importance is this second RNS today. 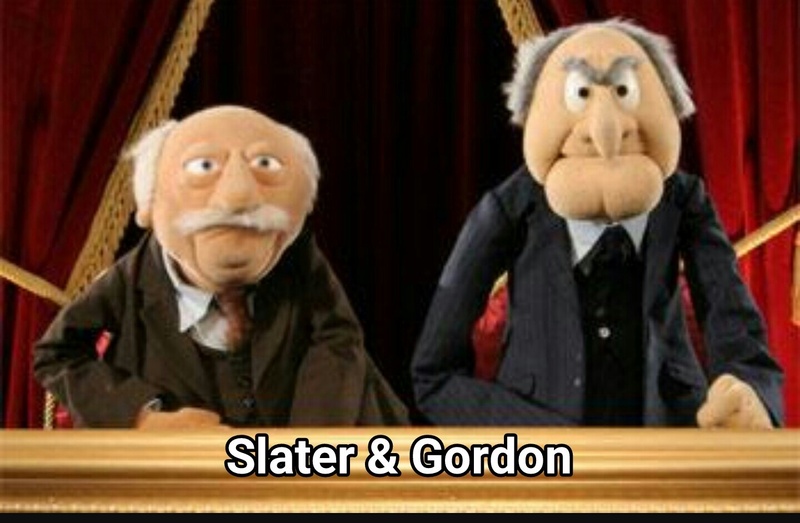 Slater + Gordon are of course the muppets from Australia who massively overpaid for the core business of Quindell, when it was on its knees. S+G could have got away with paying a fraction of the ridiculous £637m initial cash consideration (plus further contingent payments). It's been described as one of the 5 worst acquisitions of all time. This disastrous acquisition of Quindell's core business almost pulled down the whole of S+G. Indeed its share price collapsed from a peak of AUD 8 in early 2015, to just AUD 0.4 today - that's a fall of about 95%. S+G is now reliant on bank financing, and could yet go bust, as another article from the Sydney Morning Herald points out. Yes, a really useful review. "The upsides of all this complexity are incredible features, such as the ability to know if your home in Minnesota is suffering from a carbon monoxide leak even while you're sitting on the beach in Florida.". Plus they are internet connected and contain a microphone "for self test". 1984 was meant to be a warning, not a blueprint. The majority also appear to refer to conveyancing, so assuming you believe the business model is sound, an underperforming division can/should be rectified into something more positive going forward. It was gross that Rob Terry was allowed back into a listed company at all; his dubious past was well known so he was avoided by experienced investors like Jim Slater and Hargreave Hale. Those responsible for the losses are the professionals, particularly the auditors who let him through their nets because of the fees he generated. If they reckon will be generated then they allow more or less anyone with a pulse onto their client lists. Also culpable were the Investors Chronicle and Shares magazine who both recommended Quindell as a buy. FIF results in themselves look good... but is the following a concern under "Principal Risks and Uncertainties" though? Labour costs, prices and supply - The Group, along with other food businesses, will face the risk of inflationary pressures through both commodities cost increases, further driven by currency weakness post Brexit and the National Living Wage. I think some magazines do a lot of harm, tipping shares and supporting such companies as Quindell and Globo. Unfortunately a lot of new investors get their fingers burnt. Yes directors such as Terry should be banned for life. The Directors are pleased to report that solid progress continues to be made and the Board expects to deliver results for the year ended 31 August 2016 that will meet market expectations. A significant proportion of the Company's purchases are made in U$ dollars and, therefore, the increasing strength of the US$ against £Sterling continues to put pressure on Group profitability. Nevertheless, the Board remains of the view that it can continue to mitigate the resulting increased costs. This is being achieved through the expansion of our international business, which generates revenue and profit in US$'s, and by our continuing active programme of monitoring all costs and rationalising operations where possible through increased efficiencies. Yes I think you are correct, there are concerns going forward as you have mentioned, but most food producers will have similar problems and market will get more challenging I'm sure, to me Finsbury Food (LON:FIF) seem to be one of the better managed companies in this sector. But I would not want to have too much exposure. One thing I don't like about FIF is the Long Term Incentive Plan. Thanks Andrea. CCT is a strange one, it was savaged by the referendum result despite not being expensive at the time, rallied a bit and now is getting back towards that low, on what seems to be a quite mundane announcement. The market seems to be seeing a weakness which I don't really understand (just for a change..!). The currency situation adds difficultly but does it merit those sorts of declines for what appears to be a quality business? I wonder if anyone else has views/is puzzled on this one? Yes, I read this too, but that was last Wednesday (14th Sept). So not new news and nothing to do with any price change today. As a fairpoint shareholder, I actually decided to try the product recently when I had a property to sell, so I used Simpson Millar. * Price - they were at least 20-30% cheaper than other quotes I got, and had a nice offer of a refund should the sale not complete. * I did need to call their office for clarification at one point, and the person I spoke to was very nice and helpful. * A simple google search didn't seem to locate them. I only found them because I knew who I was looking for. * The communication has been a little bit poor, sending me the wrong forms, asking me for the same information multiple times etc. * From my interactions with them, there seems an awful lot of scope for automating communication and process. Overall I'm happy to hold. I've certainly not seen anything that gives me a red flag, in terms of using their service. Yes I agree. I have put £SPRG on my barge pole list just now. The note I put was "dont know why but just don't like". Can't put my finger on it but not for me. Wished I had realised this about Crawshaw (LON:CRAW) before I bought that one! Looking at the reviews for random selections of other solicitors, the site seems to have slightly more positive reviews than negative, although with some polarisation of reviews. So I would see the reviews as generally indicative of service quality, which is bad news. From a couple of property transactions, I know the quality of the solicitor is critical. If you get a slow one, there is simply no way to get them to move at a reasonable pace. Having learnt the lesson, next time I asked around until I found one who was recommended by a friend. I was delighted with the service. The more pressing issue is to make sure I do more due diligence checking on line reviews for such stocks. I would be wary of investing in Mitie, I remember it was flagged as a top short at the 2015 UK Investor Show by Matt Earl. He has some analysis on his website, showing how the situation is similar to the (delisted) Connaught. Thanks - an interesting read. I actually held Mitie (wish I'd read Matt Earl's analysis earlier....! ), and sold out yesterday. My reasoning being that, firstly, management have clearly messed up by entering the homecare market, and secondly, that the core business looks more vulnerable than I thought. Obviously, having sold out I won't be rushing back in. That's not to say there isn't value at today's price - there might be - but equally there are risks and Mitie also has financial risk, which makes things more complicated. I'm increasingly wondering how investable contracting businesses are more generally. I have just bought some WH Ireland (LON:WHI), as Equity Development say that the 20% bought by Kuwait yesterday was at 140p. I can't believe they are buying a micro cap share to hold and trade. "Bought by Kuwait" sounds like it's a government sovereign fund. From their website, it seems KEH is a single Kuwaiti family's semi-private portfolio, so the investment may not be out of scale. True. I wonder what else they hold in their portfolio. Would be interested to know other peoples notes on Watchstone (LON:WTG) a year after this was written. I have very much warmed to it over the last month and decided to buy in today.